Santa Barbara, exhausted of free state money, gains reallocation from Avalon. SANTA BARBARA — Applying for a grant can be tricky. Determining the amount of funds needed can be difficult. State of California’s Parks and Recreation Division of Boating and Waterways (DBW) recognizes this, which is why a certain program offered by DBW allows for funds to be transferred. Avalon accepted a $32,400 grant from DBW in September 2015. The grant provides reimbursement funds for the Surrendered and Abandoned Vessel Exchange (SAVE) program. The funding is available for two years, so Avalon’s SAVE grant is soon to expire. “The city of Avalon has not been able to use these funds and the Division of Boating and Waterways allows grantees to ‘pass through’ to assist other agencies, according to the Avalon City Council June 6 agenda. “The city of Santa Barbara Waterfront Department has requested $10,613.00,” the agenda continued. Derelict boats are currently not an issue in Avalon. 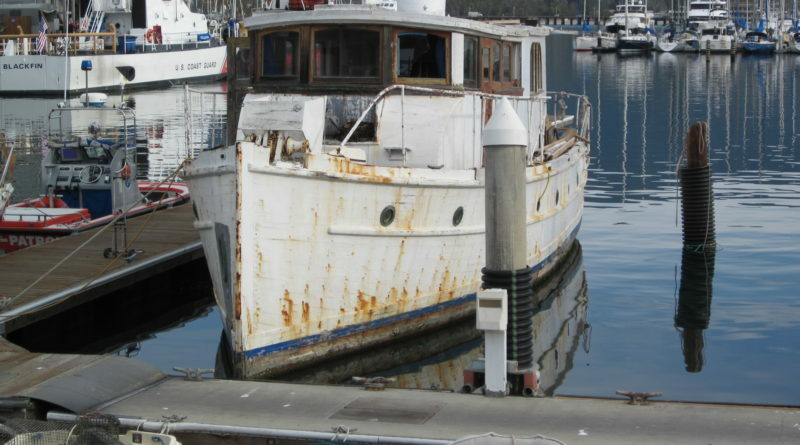 The harbor is home to only one abandoned vessel at this time, Harbormaster Brian Bray confirmed on June 15. Santa Barbara did receive a $30,000 grant in SAVE funding from DBW in October 2015; the city exhausted its grant funds as of December 2016. DBW reached out to Avalon after noticing all its funding would not be used before it expired, so the agency facilitated a transfer of funds between cities, according to California Department of Parks and Recreation Deputy Director of Public Affairs Gloria Sandoval. “If another agency has a grant and didn’t spend it, then they could do what’s called a ‘funds assist’ with another agency,” McCullough explained. “That’s what we did with San Mateo district, and that’s what we are doing with Avalon. “We’ve [received] grants every [2-years]. They don’t always give us all the money we ask for, but since we’re showing that we are spending more money than they are giving us, we hope the amount will increase the next grant cycle,” McCullough continued. Such a practice is interesting, however, in light of other budgetary items struggling, seeming annually, for state funding. Gov. Jerry Brown and state legislators, for example, pushed for a gasoline tax increase – which would directly affect boaters – based upon potential budget shortfalls for infrastructure funding. Sandoval replied a city’s plans for SAVE funding does not always synchronize with actual events, as some cities require less than requested and others more. “The SAVE program is designed to allow agencies to assist each other based on actual need. DBW calls it Funds Assist. Avalon is using the remaining funds in their grant to assist Santa Barbara with the unexpected vessels they need to dispose of. This allows DBW to maximize the use of all of the funding in a given year,” Sandoval continued. McCullough sees this SAVE program as a huge success saying the program has helped to reduce the number of abandoned boats. People are able to turn in older boats to the city through this program, so the boats don’t end up at the bottom of the bay or as marine debris. “It’s a good program to help the state get rid of boats before they cause pollution or become a wreckage removal problem,” Bray commented. Santa Barbara Harbor Operations Manager Mick Kronman expressed his gratitude to DBW for such a great program and to the city of Avalon for sharing their grant money. The city’s Waterfront Division, nonetheless, has applied for another grant, but the grant is still pending and, if approved, wouldn’t go into effect until October. Grant funding through SAVE is not just for abandoned boats, as McCullough pointed out; funding also covers vessel turn-ins to prevent abandoned boats from becoming an issue in the first place.